Located just north of the Alice Springs town centre, our main property is located within an easy walk of our local shops that include supermarket, butcher, liquor store, chemist, and take-away. The 1 bedroom entrance is on Knuckey Ave. The 2 bedroom and Studio has entrances via the (Kingfisher/Studio) gate or laneway off Babbage Street. The 3 bedroom has entrance on Babbage Street (Pond gate). Whatever way you are getting to Alice Springs, please let us know your estimated time of arrival including flight details, so that when you arrive at Vatu Sanctuary we can be there to welcome you and to show you around. Whether you are arriving via the airport or driving, just stay on the Stuart Highway until you see the Northside shops on your left (the west side of the Stuart Highway). Immediately after the shops take the first left, into Tietkins Avenue. Then take the first right into Babbage Street. Drive to the end of Babbage Street. 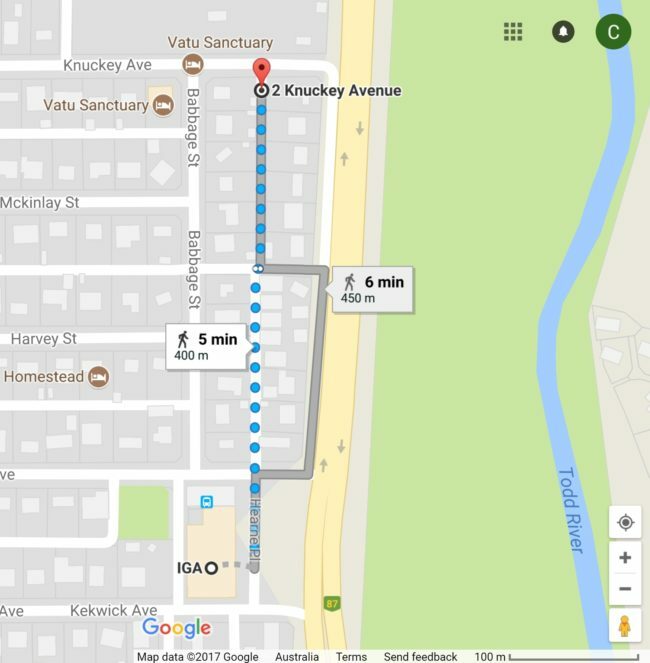 Vatu Sanctuary is on the left corner of Babbage St and Knuckey Ave. Depending on your apartment, your entrance will be on either Babbage Street or Knuckey Ave. If you are arriving in Alice Springs from the north side of town, follow the Stuart Highway pass the Herbert Heritage Drv turnoff to the Telegraph Station. About one km along, you will approach the Northside Shops (on the right). Take the right turn BEFORE the shops onto Tietkens Ave. If you are arriving in Alice Springs from the west of town, follow the Larapinta Drive into town. You pass through 2 roundabouts. As you approach the railway crossing, prepare to turn left onto Stuart Highway. Stay on the Stuart Highway until you see the Northside Shops on your left (the west side of the Stuart Highway). Distance to our local shops that include IGA supermarket, butchers, pharmacy, and liquor shop is about 400 m (easy flat walk).